How’s the weather? It’s a question you can ask anyone because weather happens to all of us. Songs are written about it. Songs are written about talking about it. But what makes someone go from enthusiast to professional? For David Drobny, it was Hurricane Katrina. Drobny attended high school in Gulfport, Mississippi, and was there after the storm wove its destructive path through the area. Seeing what nature can do, and the aftermath and long-term effects on humans, moved him from being someone who watched the weather to someone who reports it. 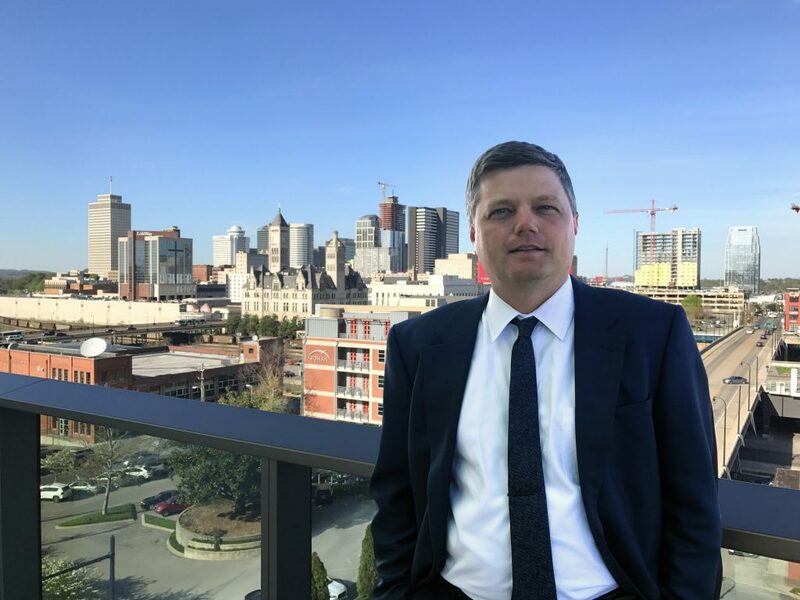 Drobny’s one of the guys behind Nashville Severe Weather (@NashSevereWx), an indispensable online and social-media presence that’s now followed by hundreds of thousands of Middle Tennessee residents. When storms loom, he and his team tweet out facts and figures gathered by their own equipment, from local meteorologists and weather services, and even from a growing posse of weather watchers. If the weather’s fine, the posts are more informative and entertaining. (The GIFs alone are worth a daily check-in.) To date, the Twitter handle has roared past 119,000 Twitter followers, all because Drobny is a self-confessed weather nerd. “Remember when you’re in middle school, and they teach you about how Gutenberg got religion away from church leadership and into the hands of the people? The Gutenberg moment for weather came in 2008 when Mike Gibson released his software Gibson Ridge Software,” Drobny says. A Hawaii-born Army kid, Drobny spent some of his childhood in Nashville and always wanted to come back. After wrapping up law school at the University of Tennessee, he had his opportunity. Middle Tennessee’s weather is eventful, and he found himself wanting to track it. Why? Because TV meteorologists and broadcasters must cover a wide service area, but he was mainly interested in what was happening where he works (Nashville) and lives (Williamson County). So he started, and word got out. “Whenever we’d have a round of supercells or a small line coming through, a few friends would be calling and asking exactly where the storms were, and I’d tell them,” he says. “By 2010, it got to where there were three people always calling me at the same time. They’d call right when storms were on us, and those calls were distracting. This was also during the era of the flip phone, so texting was a huge pain. The Twitterverse is in love with Nashville Severe Weather. Who knew storms were cool? This meant that Drobny would be operating as a weather-watcher most all the time, utilizing both his Williamson County home and his downtown office. An attorney with Manier & Herod, he benefits from a lofty perch with commanding views, so he can see what’s coming while also following modeling charts and radar software. 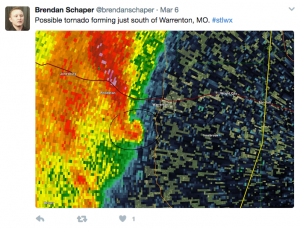 The Twitter account was repurposed from a private handle to NashSevereWx, and following coverage of a big thunderstorm that rumbled through, some well-known Twitter users retweeted some posts. The numbers continued to climb. And then came the photos. “People began sending me photos of storms,” he says. 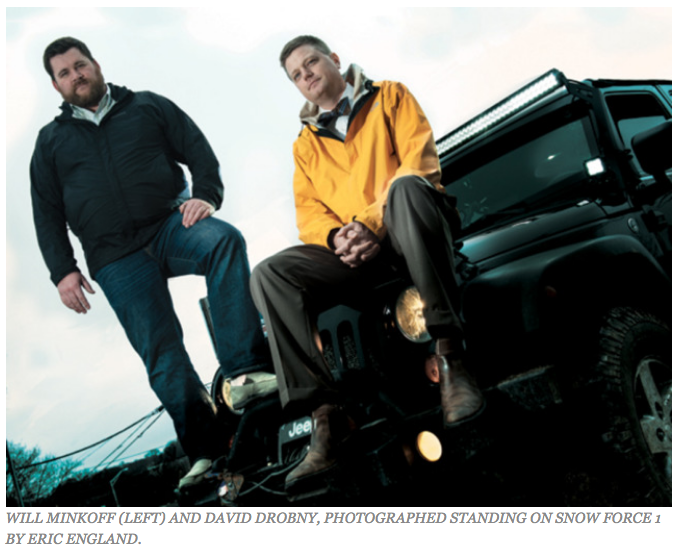 Powerful software allows even casual weather-watchers to keep up with storms and other threats that media and government meteorologists are eyeing as well. It could be a downpour, heavy hail or any combination thereof. If a report of hail comes in, for instance, complete with photographic evidence, that’s data Drobny can report back out to media and agencies. Drobny is hardly the first well-meaning citizen to blow up a television newsroom tip line, so he knew some credentialing would be in order to be taken seriously. He got in touch with Tom Johnstone, then the Warning Coordination Meteorologist with the National Weather Service’s Nashville office, and an agreement was hammered out. Although local television stations are hyper-competitive when it comes to who’s first and most accurate about the weather, it’s all happy families when it comes to Drobny and his team. That means sending along not only their own information, but also information and photos and that come in through social media. 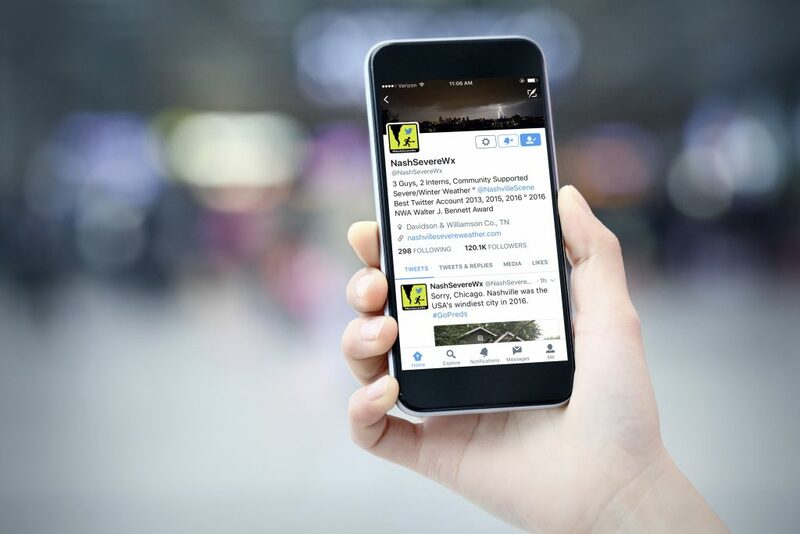 Twitter followers can post using the hashtag #tSpotter in a tweet and the team will see it and investigate. That means running some quality control, making sure they’re not being pranked with an old photo from elsewhere online. A little research, a little comparison with radar to see if it’s likely, and into the feed it goes. 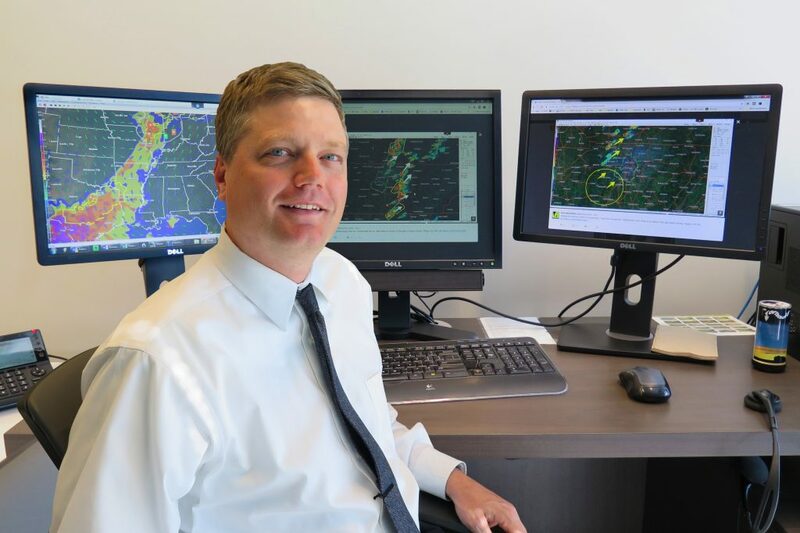 Two years into Nashville Severe Weather, Drobny was managing a website, Twitter feed and relationships with the area’s professional weather community. By late 2011, he knew he needed help. 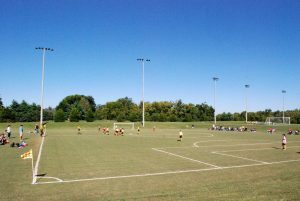 A full-time attorney with a wife and two children, his time was eaten up with his first priorities: family, work, coaching soccer and baseball, and other commitments. 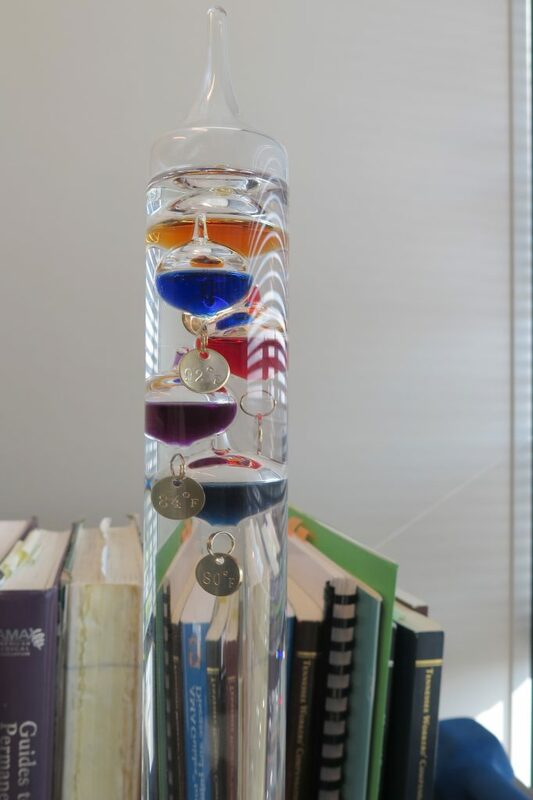 While not scientifically accurate, a Galileo thermometer makes for some nice, weather-oriented desk ornamentation. He met up with Will Minkoff, another weather watcher who’d been using a local scanner and Twitter to relay reports, and the two teamed up. The combined efforts of David and Will grew the audience. Four years later, the two met Andrew Leeper and he became the third team member. “They’ve helped me stay sane and meet my primary obligations,” Drobny says. “Every time a big storm came in we’d get more Twitter followers and were getting noticed by local media. 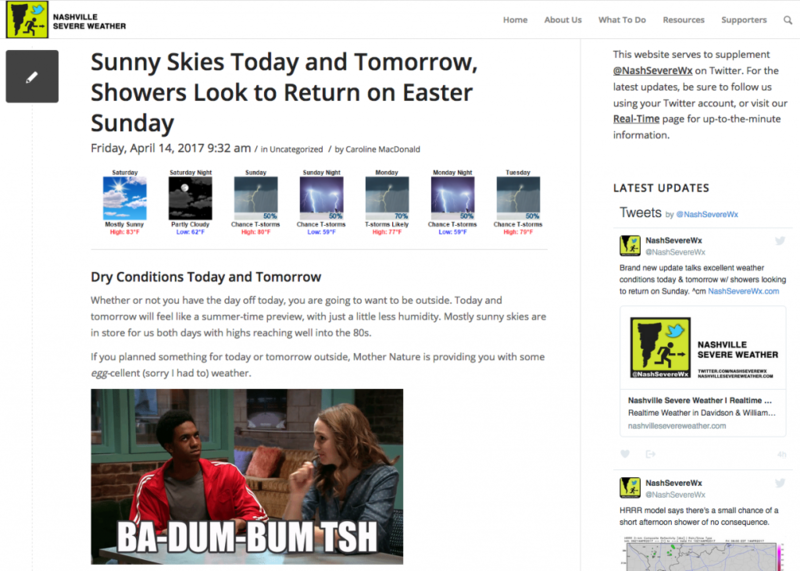 The team has survived website crashes (a recent outage brought howls of dismay throughout the region, and led to a more robust platform and a professional service provider), serious storms and near-misses. They know what they want and what they don’t, the latter of which includes straying from their Davidson/Williamson coverage area, which might in turn spur the kind of burnout that would cause them to walk away. Instead, they want to make what they’re doing better. 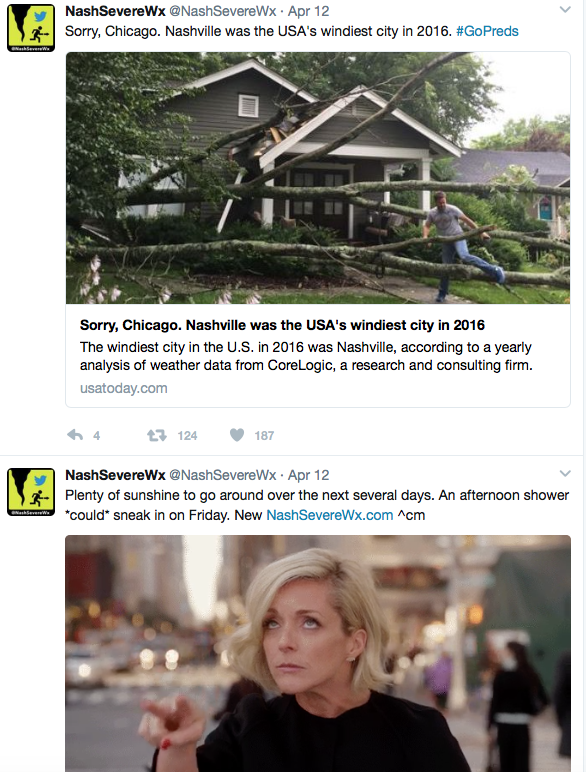 Nashville Severe Weather’s Twitter feed is equally enthusiastic about blending local weather info with related news and commentary. “I’ve never thought about quitting, because I love it,” Drobny says. “I have fun doing it; it’s my hobby. It’s incredible that so many people follow it. So on they go, this intrepid band of weather watchers, determined to remain open-source and accessible. And not starve. Their first idea: Patreon, a platform which allows people to voluntarily donate a small amount on a monthly basis. “We care about it. I’ve stood in hurricane damage in places where I have lived,” he says. “You’re different after that. Meet the team: Will Minkus, Andrew Leeper and David Drobny, back; Mississippi State University interns Caroline MacDonald and Brendan Shaper. Photo: Gresham, Smith and Partners. “I’ve never had a bad day out there,” says Drobny, who has played at the facility as a kid, coached there and served on its board. 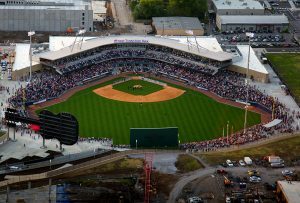 “We loved Greer Stadium, and I liked taking my kids there, but the new park is great. 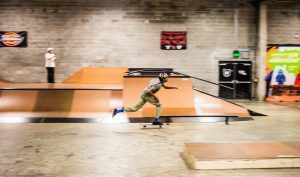 “My son is a casual skateboarder, and there’s nothing he likes more than to go down there on a Saturday morning. So, how does a college student a few hundred miles from Nashville cover Middle Tennessee weather? Pretty accurately, it turns out. Meet Brendan Schaper, an operational meteorology major (with a minor on geospatial information systems) at Mississippi State University. He first heard of Nashville Severe Weather as a freshman, and soon he was on board. He’s now in his second year as an intern, and once he graduates he’ll pass the baton. During any given week, Brendan and other interns write website copy, both serious and humorous, as well as pull together images and other artwork. It’s great writing practice, as well as terrific exposure, he says. “It’s been a fantastic experience,” Brendan says. “David began this with the intention to make the public more aware of the weather, and when I came on board I saw the impact the he, Will and Andrew had already made — and will continue to make. 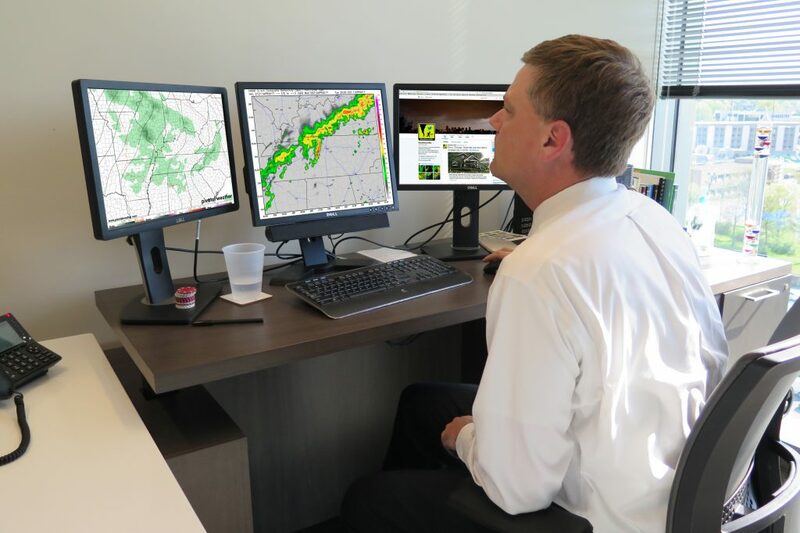 Three minds act as one when it comes to operating Nashville Severe Weather. In addition to Drobny, there’s Will Minkoff, a Continuity and Preparedness Professional, and Andrew Leeper, a worship minister at Brentwood Hills Church of Christ in Oak Hill. Like Drobny, each can point to the moment that weather became more than a casual interest — and it happens to be the same: the April 1998 tornado that roared through Nashville. 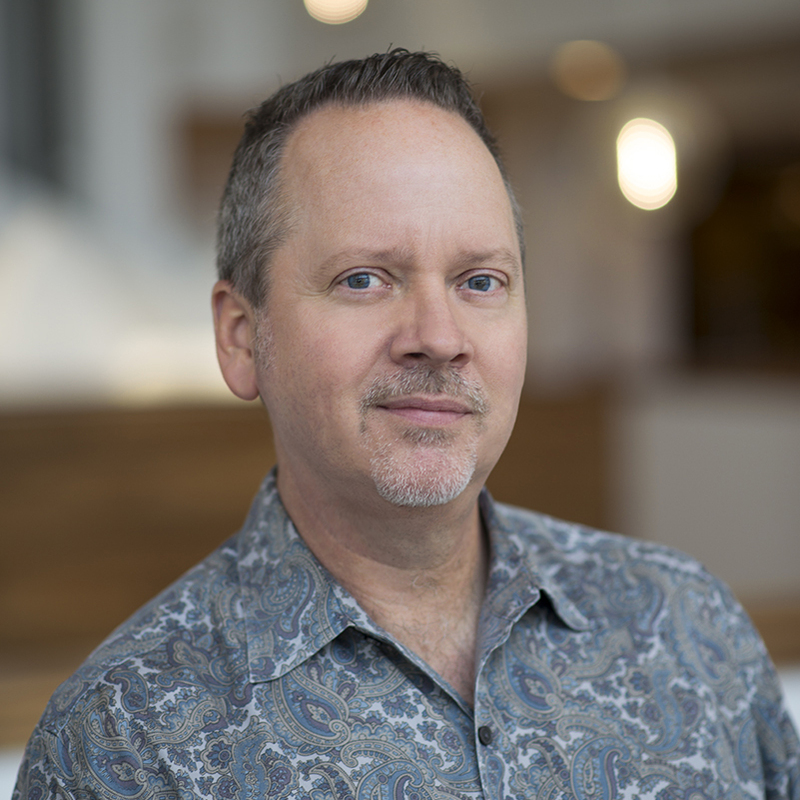 “I remember after the 1998 tornado, when Channel 5 was knocked off the air, Chris Clark and some of their team drove to their transmitter off Brick Church Pike,” Leeper recalls. Click the photo to read more about the team from the Nashville Scene. That was as springtime storm, but Leeper also remember how the ice storm of 1994 affected Nashville. That led to a saying he’s kept in his mind: No matter what it takes, the people who don’t know what’s coming deserve to know. Although he flirted with a career in meteorology, his life path wound in a different direction.